Wow…is this Grama’s real recipe? I’m FREAKING OUT to have it!!! My mother-in-law has a wicked-awesome recipe that I have used the last couple of years but none beat Grama’s!!! My m-i-l adds celery seed, xtra sage, eggs and fine shreds of turkey meat to her recipe. Maybe someday I’ll try a cosmic blend on the theme! Oh lucky day…and happy thanksgiving to us!!! Thank you thank you!!! I just made this for my thanksgiving dinner and it was such a hit! I split the recipe in half, and it still made a boatload! Yeeeeahhh!! Ours is just coming out of the oven this very minute and BABY does the kitchen smell goooood! I’m so glad you made it. Save the leftovers in a ziploc in the refrigerator and it will keep for 3-4 days. If you have way more–it freezes well. I reheat it in the toaster oven and eat it for a week! I’m pretty sure we will need a new bowl very soon. Like the next time we make this stuff. That little crack is getting very serious and we need to replace it before we have no bowl on the day we need it. This is the one–honed and tweaked and jimmied with over the years. It’s cooking in my kitchen this very minute! We used to dump the whole can of Chicken with Rice soup and then we’d have rice and celery and bits of chicken in the stuffing too. I just use the broth and I ALWAYS use Campbells soup broth. It just tastes better. The End. They have lots of really cool kitchen stuff at great prices. And bowls. Big ones – probably some bigger than you will ever need. I’m no cook, so I have no idea how much a cube of butter is… Do I put 7 sticks of butter in??? If that is a stupid question, I’m so sorry. 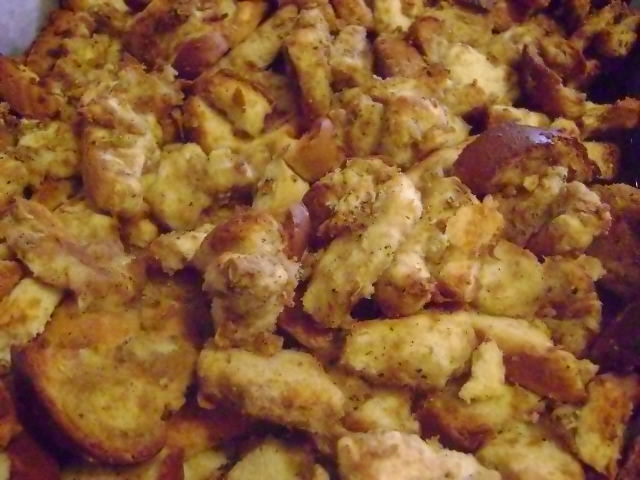 I think this recipe is a lot like the one my mom always made, and this is my first thanksgiving since she passed away. It’s funny how so many memories can be tied to food. If you get this message, let me know!